Kassos, the most southern of the Dodecanese, is only 27 nautical miles northeast of Crete. Its first inhabitants are thought to have been the Phoenicians. Homer mentions it in his catalogue of the Greek cities that took part in the Trojan War. Kassos is a mountainous island with a steep, rocky coastline and few beaches. The capital of the island is Fri, built on picturesque Bouka Bay. 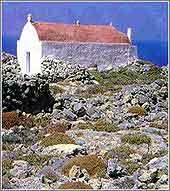 Its old stone houses - many of them constructed by sea captains - extend on both sides down to the sea. To the east and very near Fri is Emborios, the island's other coastal village. It boasts a beautiful church dedicated to the Nativity of the Virgin. Other villages include Agia Marina, set on a hill just one kilometre southwest of Fri and Arvanitohori, southeast of Agia Marina, nestled in the island's only valley. Two kilometres from Agia Marina there is a cave called Sellai, 30 metres deep and 8 metres wide with impressive stalactites. Swimmers will find pleasant beaches at Fri. Emborios, Ammouda and on the nearby islet of Armathia. Kasos: Poor shelter; Fuel & water in town; taverns.